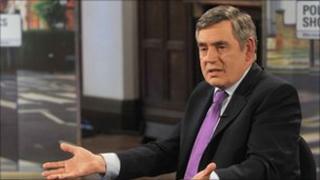 Image caption The Sunday Times reported Gordon Brown had purchased a flat at a "knock-down price"
Gordon Brown is said to be "shocked" after it was alleged the Sunday Times targeted his personal information when he was Chancellor. Documents and a phone recording suggest "blagging" was used to obtain private financial and property details. The Browns also fear medical records relating to their son Fraser, whom the Sun revealed in 2006 had cystic fibrosis, may have been obtained. News International said it would investigate the claims. A spokeswoman for Gordon Brown said the former prime minister had "now been informed of the scale of the intrusion into his family's life". "The family has been shocked by the level of criminality and the unethical means by which personal details have been obtained. The matter is in police hands," he said. Mr Brown's wife Sarah has responded to the news on Twitter with a message which read, "so sad to learn all I am about my family's privacy - it is very personal and really hurtful if all true #notw et al". In a statement, News International said: "We note the allegations made today concerning the reporting of matters relating to Gordon Brown. So that we can investigate these matters further, we ask that all information concerning these allegations is provided to us." The company, a subsidiary of Rupert Murdoch's News Corporation, owns the Sun and the Sunday Times, and also owned the News of the World which was shut last week amid allegations of phone-hacking and illegal payments to police officers. Addressing MPs in the the Commons, Culture Secretary Jeremy Hunt described blagging as an "awful" practice and said the judge-led inquiry into phone-hacking would look at all illegal methods newspapers may have used in the past to obtain information. Culture Secretary Jeremy Hunt confirms that he is referring News Corp's bid to take over BSkyB to the Competition Commission. It comes after News Corporation withdrew its proposed undertaking to sell Sky News as part of its bid. Labour MP Tom Watson says the position of John Yates, assistant commissioner at the Metropolitan Police who led the original investigation into phone hacking, is "untenable"
The latest allegations relate to personal details it is claimed were obtained for a front-page Sunday Times report that Mr Brown, who later became prime minister, had purchased a flat owned by Robert Maxwell at a "knock-down price". Blagging, or "knowingly or recklessly obtaining or disclosing personal data or information without the consent of the data controller" has been illegal since 1994. The blagging reports concern alleged attempts by someone said to be acting for the Sunday Times who posed as Mr Brown and obtained details of his Abbey National account in January 2000. The decision to refer News Corporation's bid for BSkyB to the Competition Commission has not got the government off the hook. But it has won ministers some political wriggle room. There will now be an automatic six month-plus breathing space while the commission does its work. This is not ministers dragging things out by consulting further but a formal pause, relieving pressure for a decision. At the same time, the government has also tried to give itself some more political space by stepping up the pressure on News Corporation. The prime minister said that if he was Rupert Murdoch, he would concentrate on cleaning up the phone hacking mess at News International rather than focusing on the next corporate move. The Deputy Prime Minister, Nick Clegg, was more explicit, saying that Mr Murdoch should drop the bid. But the government itself was on the receiving end of some ferocious political pressure in the House of Commons. Labour leader Ed Miliband was cheered on by his MPs when in particular he questioned David Cameron's account of how he came to hire Andy Coulson, the former editor of the News of the World, as his head of communications. He said it "beggars belief" that none of Mr Cameron's officials passed on warnings about Mr Coulson and added: "This issue goes to the heart of the prime minister's integrity." Strong stuff, the parliamentary equivalent of saying: "I don't believe you." Tory MPs hit back by pointing out how Labour had repeatedly failed to tackle the issue of phone hacking. But in the Commons it was Labour MPs who had their tails up. It was discovered by the building society's fraud department which alleged someone successfully called their Bradford call centre six times pretending to be Brown and were given information. In letters obtained by the BBC, the Abbey National wrote to Sunday Times editor John Witherow concluding it had suspicions that "someone from the Sunday Times or acting on its behalf has masqueraded as Mr Brown for the purpose of obtaining information from Abbey National by deception." The Abbey National said to Mr Brown's lawyer it was a "well-orchestrated scheme of deception". Abbey National has not been able to identify the blagger, and did accept in a letter to Mr Brown it did not have conclusive evidence. However, the Guardian journalist Nick Davies has alleged a former actor John Ford carried out specialised blagging from banks during this period for the Sunday Times. This allegation is detailed in his book Flat Earth News. On the reports on Fraser Brown having cystic fibrosis, the Brown family believe only medical staff treating their son had access to the records, and are worried they may have been accessed illegally. A well-placed source has told the BBC that in 2006 when she was editor of the Sun, Rebekah Brooks called the Browns to inform them she knew that their son Fraser had the condition. Friends of the Browns say the call caused them immense distress, since they were only coming to terms with the diagnosis, which had not been confirmed. It has also emerged that Scotland Yard wrote to Mr Brown and his wife Sarah warning them that their personal details have been found in notebooks belonging to Glenn Mulcaire, the private investigator jailed for six months in 2007 for hacking into the phones of royal aides. This contradicts advice given to Mr Brown last year. Mr Brown's spokesman said he had passed all relevant information to the police "some time ago".